In my story, “The Ugly Duckling Remixed”, there is a mother who gives birth to three ducklings; ducklings 1 and 2 w just like their mother, except smaller. “Ugly Duckling”, however, appears gray and unlike the others. A new duck appears and tells the mother that her gray duck looks just like a newborn turkey. The mother questions this, but eventually realizes that she gave birth to it and that it would be impossible. The other duck flies away and the mother and son go to the pool. 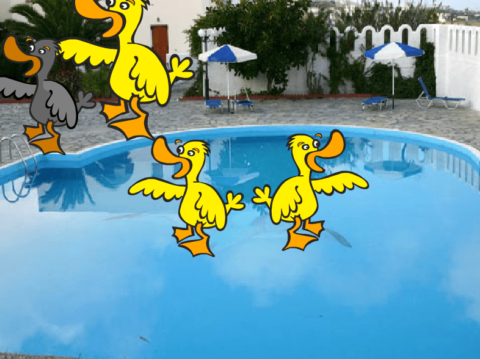 At the pool, “Ugly Duck” gets bullied and tormented by being called ugly by Ducklings 1 and 2, along with the new duck (named “Other Duck”). Ugly Ducking leaves and goes to a park to contemplate his reality. Should he stay at the farm? Should he run away? You decide. To animate this, I had to use a series of broadcasts. For example, if I was to have a duck broadcast “message1”, I would make another duck “When I receive “duck” and then continue actions like that. Multiple actions like this took place. A costume change and disappearing act took place in the final story of a decision. The ducks pixelated and “hid” when the Ugly Duckling zoomed full speed into them. I also had the Ugly Duck pixelate and change costumes into a swan in another end. This took more than several hours, and the finished product represents that. My script was essentially a “plan” to use for what the characters were to say and do, but the characters ended up saying more than the script intended to be able to follow guidelines for the animation. The Ugly Duckling Remixed by Julian is licensed under a Creative Commons Attribution-ShareAlike 4.0 International License. Being the narrator, the outcomes should both lead to happiness or both leading to sadness. My point being, “If the gray duck stays and endures torment(etc), sooner or later the duck may be accepted. 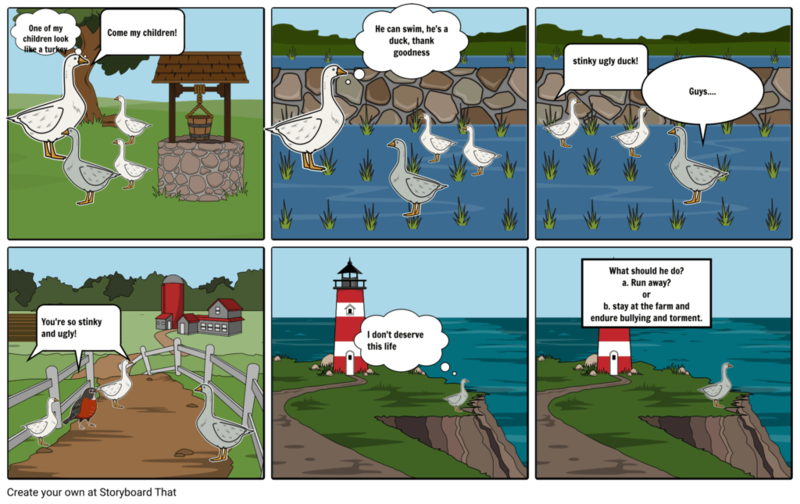 If the gray duck runs away, the duck may find a new family of ducks with diverse or many colors or ducks.” So creating a storybook from this starting situation is helpful because it helps formulate ideas of outcomes for both of the decisions the gray duck have to face.